A discussion of low head dam hydrology, and what features make a dam dangerous, and how to mitigate them. A list of dam-related fatalities in Iowa going back over 100 years. Iowa has done a remarkable job removing or modifying low head dams. A team of experts assembled with U.S. Coast Guard grant funding seeks national content validation of a set of entry level, skill-based Human (manually propelled) boat operation standards. The collaborative development of sail, power and human propelled standards will eventually be recognized (not mandated) by the US Coast Guard for incorporation in recreational boating training programs nationwide. Recreational paddling and rowing enthusiasts and especially those with experience in On-Water teaching or training are urged to participate in an on-line survey. Teams of canoes and decked boats will compete in river rescue events on the Tuckasegee River in Dillsboro, NC. 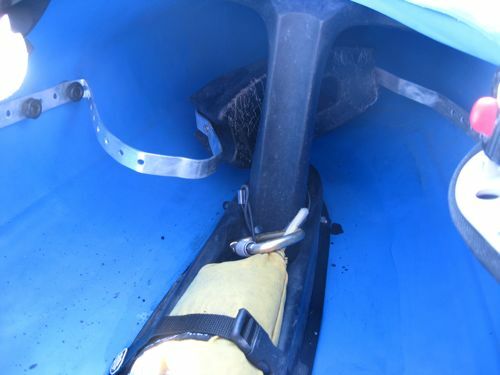 An article by Adam Herzog discusses risk taking, death, and other issues for Class V kayakers. First Published in Site Zed, a web site for thoughfrul essays about paddling sponsored by Immersion Research. Removal of Condit Dam is nearing completion and we are getting ready to celebrate the moment on Saturday September 29th. Contractors still have equipment in and along the river that will be removed over the next couple weeks and a log jam resulting from the dam breach still needs to be addressed. It's important for paddlers to wait until this work is done and everyone considering this reach needs to understand the hazards associated with the class IV/V entrance drop into the Narrows. After consulting with American Whitewater, Chelan PUD has made the decision to cancel the planned whitewater boating opportunities on the Chelan Gorge this weekend (July 10 and 11). Providing this opportunity requires a balancing act between lake level, spill and whitewater boating and unfortunately, at this time the PUD is not able to accommodate all three. Boaters should know that AW is actively engaged with Chelan PUD to document the reasons for canceling this weekend's release and we will work together to determine the best means of providing the opportunities we agreed to. The release on July 24 and 25 is scheduled to take place as planned. Over the next decade, AW hopes to serve as the collecting point for GPS data on whitewater rivers for the purpose of aiding rescue professionals. We hope to create a set of GPS data for river runs listed on AW’s website, starting with the coordinates of the put-in, continuing with info on the major rapids and landmarks, and finishing with the numbers for the take-out. Jennifer Plyler's National Accident Study was an effort to take a close look at fatal accidents in the paddlesport community using both U.S. Coast Guard and American Whitewater data. It is the most detailed look at accidents involving canoes, kayaks, and inflatables throughout the country. This has tables showing the number of fatal accidents by year and by state over the past 30 years. Laura Whitman's article compares the accident rate among kayakers with other common sports and activities.